A team is close to completing the world’s first linear Fresnel concentrating solar power (CSP) plant paired with thermal storage. It comes as storage becomes increasingly important for the economics of CSP. In October SUNCNIM, a subsidiary of the French industrial group CNIM, announced financial close for eLLO, a 9-megawatt linear Fresnel CSP plant with four hours of thermal storage. 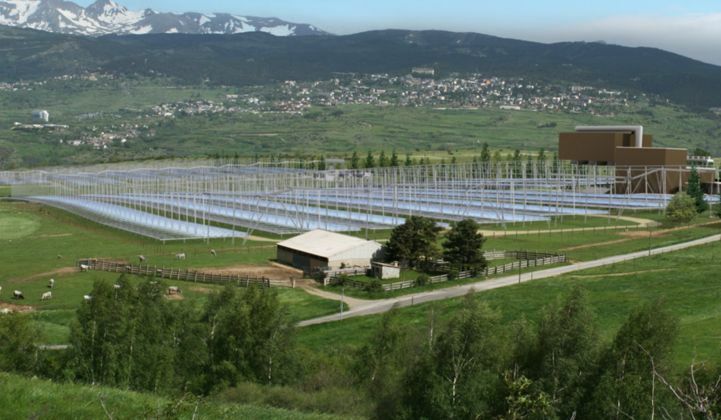 No completion date was given for the €60 million ($65 million) project, which is due to be built at Llo, in the French Pyrenees. It follows the development of a prototype at a CNIM base in Seyne-sur-Mer, near Marseille, in 2010. Although the French power giant Areva built a linear Fresnel demonstration plant paired with storage in 2014, eLLO “will be the world’s first Fresnel solar thermodynamic power plant with the capacity to store several hours of energy,” according to a SUNCNIM press release. The development is significant because Fresnel is the simplest and cheapest of four currently available CSP technologies. But that doesn't mean adoption is high. At present, the total Fresnel CSP capacity in operation worldwide amounts to little more than 177 megawatts. That compares to almost 4.2 gigawatts of capacity for parabolic troughs, the oldest and most established CSP technology; and more than 682 megawatts for solar power towers, the preferred technology for upcoming solar thermal giants such as SolarReserve’s Sandstone project. In recent years, as all CSP technologies have been undercut economically by PV, the biggest factor for success has been whether or not a project comes with storage. To date, storage has only been paired with power towers and parabolic trough plants. Of the sixteen 50+ megawatt plants that started commercial operations before 2015 and are still working today, just four have storage, totaling around 22 hours' worth of capacity. Since 2015, though, 16 of the 18 plants over 50 megawatts that are being built or have entered operation are equipped with storage, with an average of almost 8 hours each. The remaining two projects, Ashalim in Israel and Waad Al Shamal in Saudi Arabia, are being built alongside natural-gas plants that will presumably take the place of storage. This picture is leading many observers to declare that CSP is no longer viable without backup. “For it to be competitive, it needs storage,” confirmed Tilden Hellyer, research analyst for energy and environment at Frost & Sullivan in South Africa. “Without a storage unit giving it an edge, it won’t survive," said Hellyer. South Africa is one the markets where CSP has been relatively successful, with around 35 projects announced or in planning, development, construction or operation. Jonathan Walters, an economic consultant previously with the World Bank and now advising a CSP developer called Nur Energie, said there's only one way the technology can compete with PV -- when it's paired with some form of backup. “Large-scale CSP with thermal storage is cheaper than large-scale PV with battery storage, and may remain so," said Walters. “The cost of the CSP itself is of course also falling. It may be that PV plays the role of peak daytime power and CSP with storage becomes cheap flexible baseload, eventually perhaps outcompeting coal, nuclear and even natural gas in sunny countries."